A landscape piece that is a space bender. 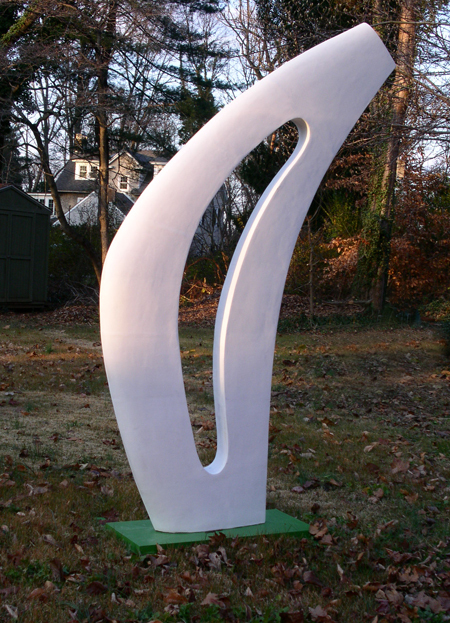 96” H x 6” W x 54” L. Fiberglass or Marble. I work in a variety of styles and media. Recently, I have taken to creating large, modern sculpture for the outdoor setting. A dynamic shape in crisp white or a contrasting color can add a burst of interest to a landscape or waterscape. I am most inspired by animal and plant forms, and seek to abstract them into simple lines. My studio sits on a lovely, tree-lined lawn in Swarthmore, PA, where I also produce smaller sculpture and ceramics. I have a long work history as a museum exhibit designer and craftsmen-at-large, having currently added telescope restoration to my many specialties. My work is available for exhibition or permanent installation. • CAC annual show. Showed "Mother Bird and Adolescent Chick" ceramic. • Gave tutorial in mold-making to the Potters Guild. • "Three Legged Lantern" ceramic invited to represent students of Ann Suchecki in her one-man show at the Community Arts Center, Wallingford, PA.
• Fiber Arts show at Art In City Hall. Exhibited "Heart Strings," a string construction. • Showed in the CAC Annual. • A large landscape piece, "Love Birds," installed in Rodney Square as part of the Wilmington Fringe Festival. • In CAC Annual, showed the ceramic piece "Fossil" based on skeletons of diatoms. • CAC Annual, showed "Pharos" ceramic lantern version of the ancient lighthouse. • "Moonflower" accepted into the Rosen International Outdoor Sculpture Competition at the Turchin Center for the Arts, Boone, NC. • "Let the Music Begin" humerous ceramic shown in the CAC annual show. • Won 3rd Prize in Annual juried show for "Moon Flower" landscape piece, also showed "Glinty Bird" ceramic. • Made maquettes of landscape pieces and arrays. • Friends of the Arts show, Swarthmore, PA, exhibited "Bomerangst." • Constructed "From Earth to Sky" landscape sculpture and several ceramics. • "Floe" ceramic penguin in CAC Annual juried show. • "Doggie's Dream" ceramic in CAC Annual juried show. • "Dream of the Walking Dune" abstract piece accepted into Woodmere Art Museum's annual juried show. • "Boomerangst" accepted into juried "Art of the State" show at State Museum, Harrisburg. Also showed "Dragonette." 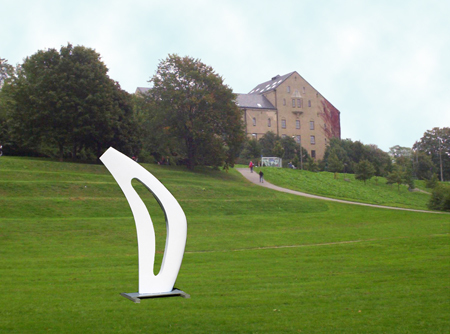 • Philadelphia Sculptors outdoor show at Woodmere Art Museum, installation show of "Boomerangst." • "Celtic Dreams" and "Key to My Heart" shown in Community Arts Center annual juried show, Wallingford. • Won first place in Community Arts Center annual juried show with "Baby" ceramic. • "Das Boid" bronze sold to private party in Weston, CT.
• Accepted into Philadelphia Sculptors summer show at Grounds for Sculpture, Hamilton, NJ. • Sculpted bust of Assateague Island Horse for Assateague National Refuge visitor center.